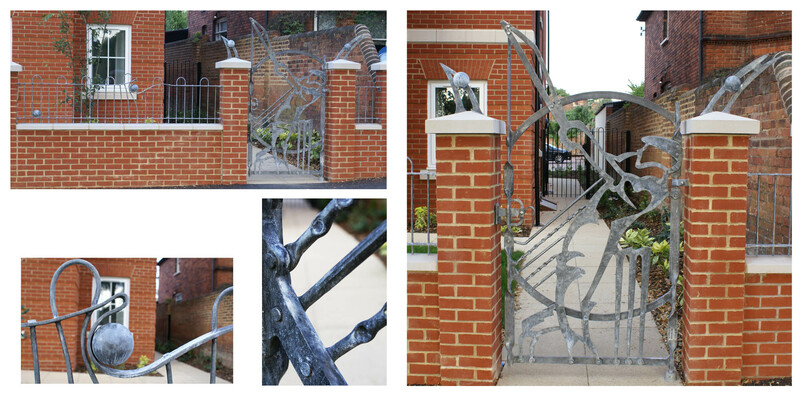 The Batsman gate and railings was commissioned by the Radian Group in early 2012 and installed at the end of June 2012. The Public Artwork commission made up Radian’s S106 planning obligation linked a new housing development opposite Surrey’s Cricket Ground in Guildford, Surrey. Radian had the foresight and trust to offer us an open brief regards to design. Radian gave us a sensible completion date which we dutifully met with time to spare. I’d like to thank Radian’s senior project manager Rob Cummins for the opportunity to create this work and their builders Leadbitter Ltd. for their support enabling us to deliver the project on time and within budget. I chose to tell a story with our Artwork. The Artwork imagery compromises of a Cricket Batsman caught in the act of hitting a ‘six’. The sculpture tells the story of an incoming fast ball, the skill of the batsman converts the fright of a fast bowled ball into the delight of a hard hit ball that no-one can field to safety. The hope was that children and inevitably adults will want to touch and try to ‘pluck’ the ball from it ‘final resting place’ buried in the ‘damaged’ the railing (they won’t be able to of course!) The intent was realized within minutes of the work finally installed, when a member of the public patting the ball ‘lodged’ in the railing as they passed by. The Batsman and stylized cricket balls have a lot of suggested movement in their forms, although I designed the structure to be totally rigid and tamperproof. The contemporary styled sculpture is made from hot forged mild steel and is reasonably ‘heavy’ in appearance. Hot forging by its nature imparts life, and suggests an organic and natural feel to what is otherwise a dead metal. There’s a contrasting surface textures, smooth rivet heads, heavily mottled textured bars etc. The sinuous, twisting body of the Batsman is at the foreground of the gate, fixed to the front of the gate frame, behind him are (intact) cricket stumps and behind that is the outline of a giant, stitched seam cricket ball. The gate frame copies the twisting action of the Batsman. The layering does not add up much depth, perhaps only 100mm, but compared to an ordinary gate it will appear deep and rich. Material density also varies, the ‘balls’ (which are hollow spheres) will sound hollow when rapped with knuckles, whereas the batsman and stumps, rigid and unyielding. The artwork is viewed mainly from passing traffic and pedestrians walking past on both sides of the road, so a substantial build is desirable. The steelwork is hot dipped galvanized and treated with Phosphoric acid, the surface is then cut back with a light abrasive. We then sealed the resultant effect with a hard wax. This is not a permanent process, just one that speeds up the final effect. Next Ironmongery for ‘Malificent’ film.